(NEW ALBANY, Ind. )—Ever dream of going behind the scenes at Walt Disney World Resort or Universal Orlando? Over the winter break, one group of students from IU Southeast did just that. John Ross, assistant professor of management, led his elective class, Topical Explorations in Business, to Orlando, Fla. on a trip that combined fun—because who goes to a theme park and doesn’t have fun?—with a look at what makes these two entertainment juggernauts tick. The students got to experience plenty of special effects. But they learned about more than just sound and lights. It’s not common knowledge, but these two purveyors extraordinaire of fantasy are also instructors in the nuts and bolts realities of business. Disney runs the Disney Education Series, offering courses for groups in areas of leadership, creativity, teamwork and culture. For its part, Universal offers the Business Learning Series, with modules in leadership, marketing, finance and business development. For the ordinary visitor, the theme parks are pure entertainment. For the students, they are living laboratories of business success. The students spent half of their days in classes learning about creative discontent, cast excellence and other concepts, and the other half observing business principles and methodologies in action at the myriad attractions. 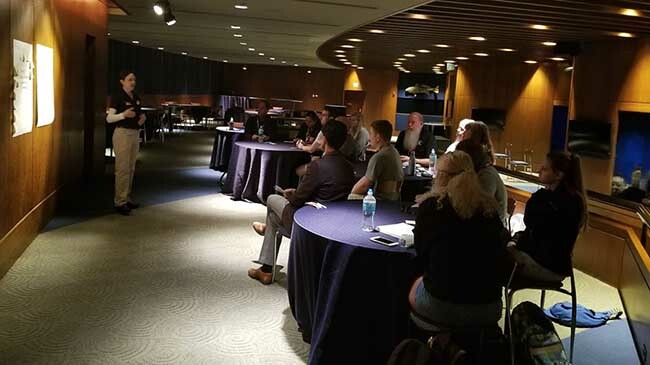 Inside the aquarium conference center at Disney’s Epcot, a Disney instructor discusses Disney’s style of teamwork with students from IU Southeast. That breadth and diversity also struck Shelly Morgan, a senior from Louisville, Ky. who envisions working in the technology sector. For Ross, the trip had multiple benefits. On one level, he wanted to expose students to enterprises that hire hundreds of thousands of people in an incredible variety of fields, many right out of college. But there was also a teaching motive: to compare and contrast the identities, cultures and strategies of two ferocious competitors. For Wrigley, it was the differing corporate cultures that made an impact–Disney’s consistency versus Universal’s individuality. 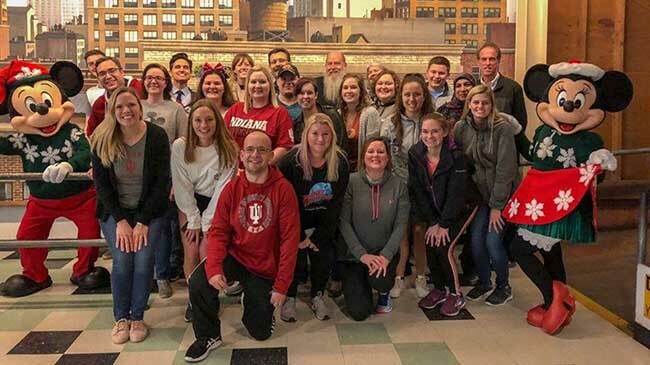 At Disney’s Hollywood Studios, IU Southeast students and faculty members pose for a group photo after their Welcome Dinner. While opinions were split on which park would be the better place to work, students agreed on the relevance of the trip to their course work. The students returned with a paper to write and impressions to share, with a greater appreciation for the challenges and successes of both organizations. Once the fairy dust has cleared, what makes magic happen is often an informed and innovative business plan. For Ethan DeGoria, a senior from Carthage, Missouri majoring in business management with a minor in entrepreneurship, the business plans of both enterprises rest on some basic fundamental truths. Homepage photo: Students take part in a discussion about Universal’s long history at the cutting edge of special effects, most prominently in major horror movies, from the silent film era to today.